Fujifilm has accidentally leaked the specs of an upcoming mirrorless camera, the X-T100. The leak was spotted by Nokishita, and a quick glance at the purported features of the X-T100 seems to show that it shares much of its tech with the entry-level X-A5. This includes a 24.2MP APS-C CMOS sensor (with the more standard bayer array, as opposed to the X-Trans design featured in higher-end X Series cameras), 4K video capture at 15p, 6fps burst shooting and a 3.0-inch touchscreen. 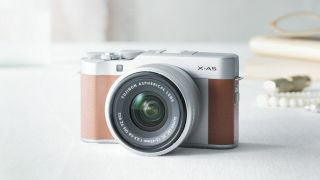 While the X-A5 sports a tilt-angle display, the X-T100 appears to feature a 3-way construction, which would likely be similar to the design used by the likes of the X-T2 and X-H1. While you have to rely solely on the rear display on the X-A5 to compose images, it looks like the X-T100 will feature a built-in electronic viewfinder (EVF) with a 2.36-million dot resolution and a magnification of 0.62x. Another key feature difference that we can glean from the leaked spec sheet is an increase in buffer capacity over the X-A5. Whereas the X-A5 can only shoot at 6fps for 10 frames (JPEG), the X-T100 has stretched this out to 30 shots. For the time being there are no images of the X-T100 in circulation, but with the arrival of an EVF we reckon the design will follow that of the X-T20. We shouldn't have to wait too long to see what the camera will look like, as Fuji Rumors reckons we'll get an announcement on May 24.